This isn’t a boozy strawberry slushy out of a machine; the Hemingway Daiquiri is as crisp and cool as it gets, made with rum, lime, and grapefruit-- shaken until icy. Pour all ingredients into a cocktail shaker filled with ice. Shake very well. 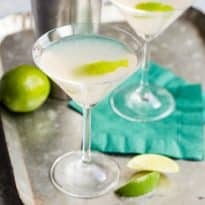 Strain into a chilled cocktail glass; garnish with thin lime slice, if desired. To make simple syrup, combine equal parts sugar and water together over medium-low heat in a saucepan. Stir until dissolved, then allow to cool before using. You can keep leftover simple syrup in an airtight container in the refrigerator for up to 3-4 weeks.